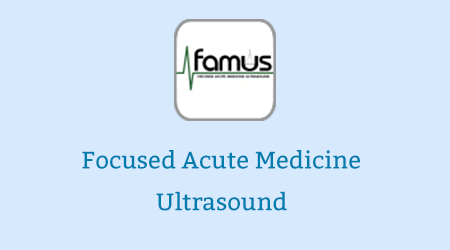 Focused Acute Medicine Ultrasound (FAMUS) is the point of care ultrasound standard created specifically for acute medicine physicians to aid the management of the acutely unwell adult patient. It is endorsed by the Society for Acute Medicine and recognised by the Acute Internal Medicine (AIM) training committee as a specialist skill. Deep vein thrombosis (DVT)/vascular access: learn about how to rule in a DVT and techniques for ultrasound guided needling. Formal Assessment: You need 75% to pass and get your FAMUS certificate. If you already have an account with e-LfH, then you can enrol on to the Focused Acute Medicine Ultrasound programme by logging in to the e-LfH Hub, selecting My Account > Enrolment and selecting the programme. You can then access the programme immediately in the My e-Learning section.